Meet the Members of El Reys! Founding member Stush Bogdan was born in Pittsburgh’s West End and now resides in Kennedy Township. 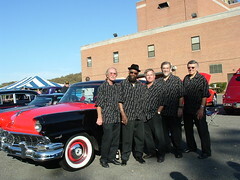 He formed the El Reys in 1961 with five Canevin High School buddies Tim Eyermann, Chuck Black, Randy Riddle, Rick Jabronski, and Bill Marszalek. After recording four songs with Ideal Records, service in the Vietnam War put an end to their brief career. Now after 46 years, Stush Bogdan has re-formed the El Reys as an Acappella vocal group with four new voices: Paul Durham, Bill Leverette, J.D. Merkel, and Tim Steele. Stush is enjoying the rebirth of the El Reys. Bill Leverette used to live in North Carolina, but now resides in Wilkinsburg and is the veteran of the group. 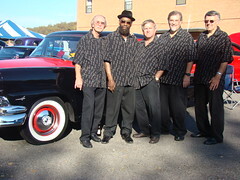 He has performed across the USA with groups such as The Cameos, Del Vikings, and The New Marcels. Bill’s bass voice is one of the best in the business. Originally from Homestead, Paul Durham now resides in Monroeville. He has been singing Street Corner Doo Wop since he was 12 years old. 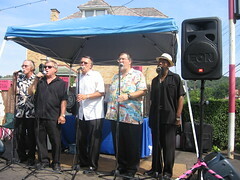 Paul sang with Bo Wagner with the group called The Cavalairs. Service in the Vietnam War also put an end to his singing career. Tim Steele from Greensburg has always been a “Shower Singer.” He credits the music of “The Beach Boys” for his introduction to and great love of vocal group harmony. His longtime love of the Oldies has brought about his other passion of collecting and restoring Vintage Jukeboxes, which he has been doing for the past 25 years. If you need a Jukebox restored, contact one of us. J.D. Merkel is originally from Monaca, but now lives in Baden. J.D. has been a record and music collector for over 50 years and a disc jockey for over 40 years. He is now doing what he loves the most, which is singing Doo Wop, playing at Car Cruises, playing oldies, and enjoying retirement.